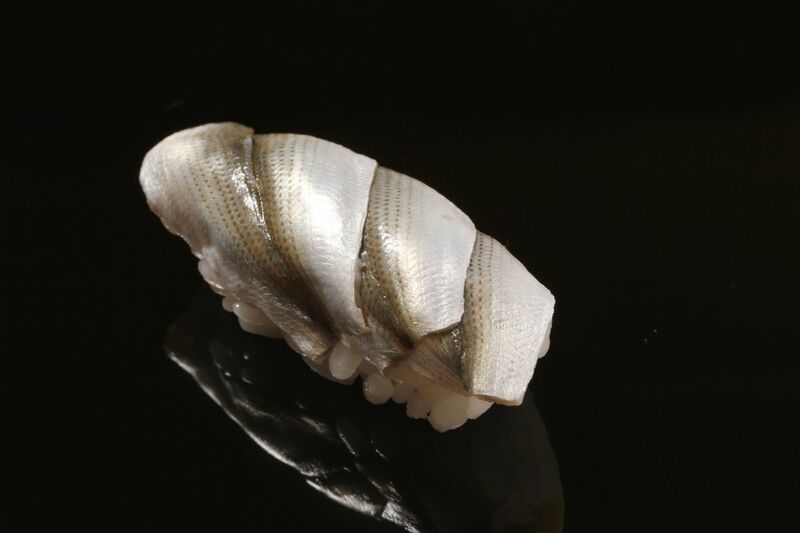 Artistry, craftsmanship and a fastidious passion for the finest sushi. 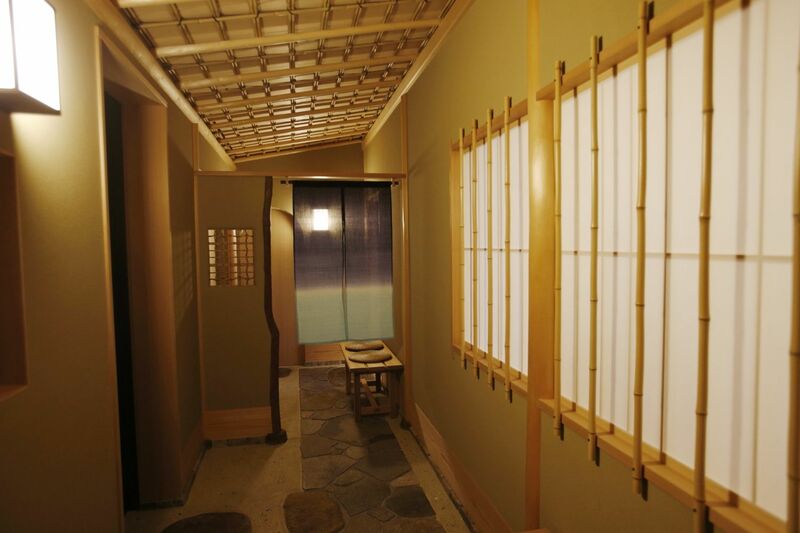 A softly draped noren, the clean soothing smell of freshly cut timber, an interior resembling an exquisite ryokan – these are the elements that greet you the moment you step into Ginza Harutaka. Craftsmanship exhibited at every turn. You already have a sense that more than a chef, an artist awaits you, signalling the beginning of a truly enjoyable sushi experience. With the move to this new location in June 2016, Chef Harutaka Takahashi resolved to do everything he has ever dreamed of. And you can tell as he stands proudly behind the expansive counter that the results impress even him. He has spared no expense in creating a space that satisfies his vision: marble floors, soft olive green walls, and no sign of modern amenities. Handcrafted from Japanese cedar without a single nail, the chairs are so unique you wonder if they belong in an art gallery. You may feel intimidated, but when you take a seat, they are soft and welcoming, giving you just the right lean back to ease into your place at the counter. The pristine hinoki counter comes from a single piece of timber from Nara and is so large that it seats twelve. 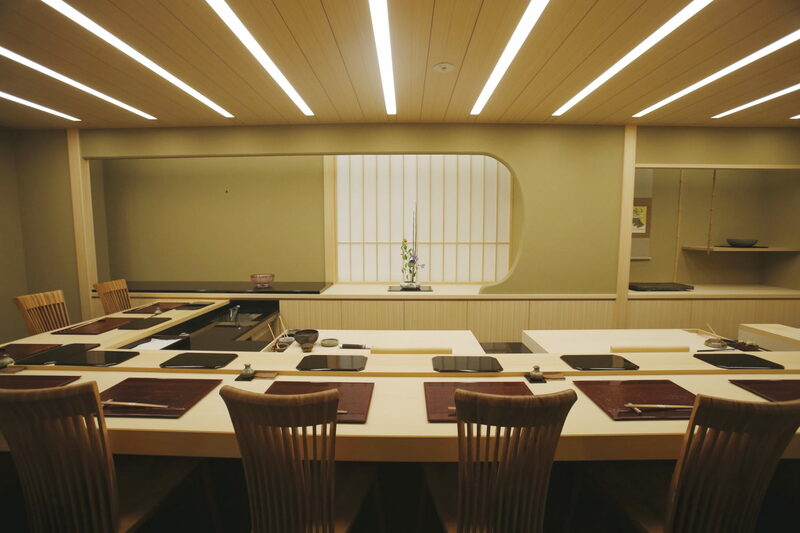 A private room in the corner of the space is secluded enough and yet still allows the guests to enjoy the hum of the sushiya. The interior’s simple and smooth lines are accented by a seasonal ikebana display, the flowers personally sourced and arranged by the chef himself – he clearly has a great deal of confidence in his own sense of style. 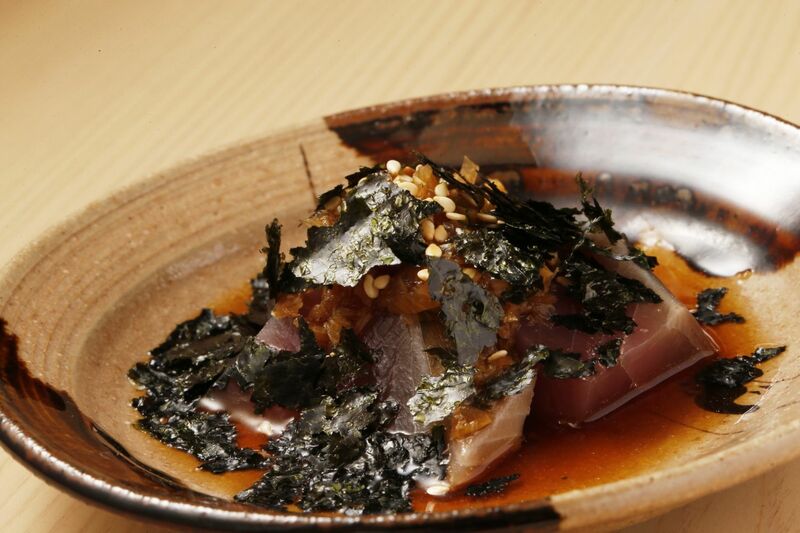 As the dishes start arriving, it becomes immediately clear that for Chef Harutaka flavor is everything. 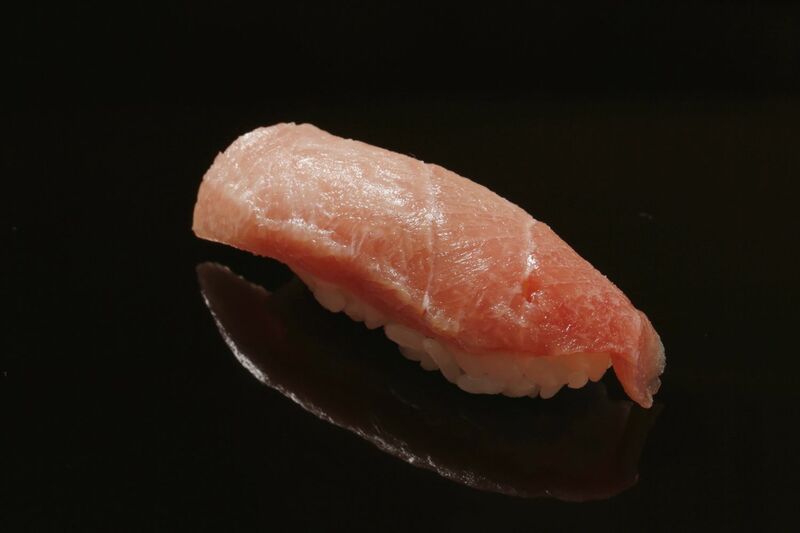 Not color, not layers of fat on tuna – just flavor. The dishes are restrained but beautiful, and the flavors are rich. 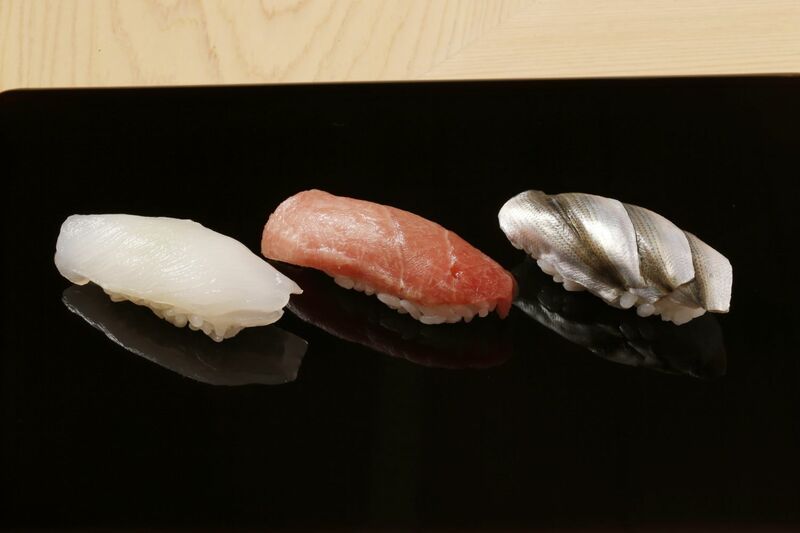 This traditional sushiya sets itself apart with the best seasonal ingredients expertly prepared. 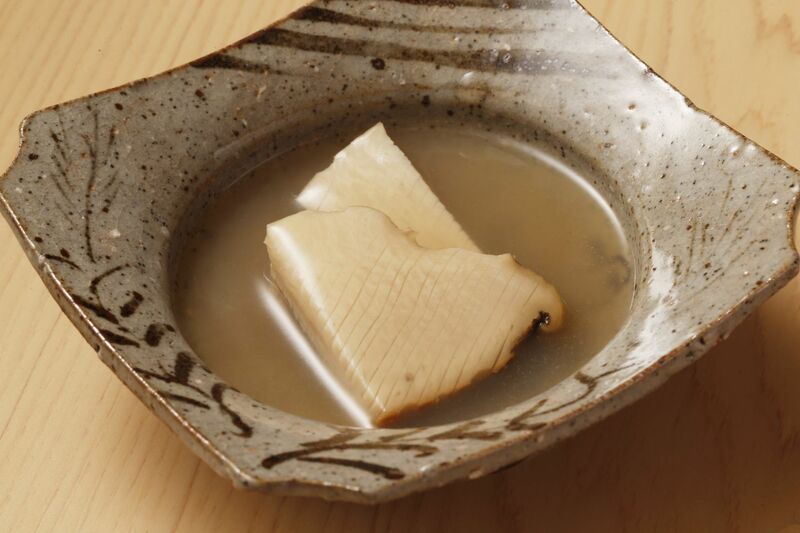 Hamo pike conger cooked in a hamo dashi gelée topped with white sesame seeds; abalone lovingly scored with fine incisions in a luxurious sauce containing kuzu; straw-seared bonito brushed with nikiri-joyu. These are some of the appetisers dishes you might find stimulating your palate before a course of premium nigiri of squid, kohada, and anago. Not forgetting a selection of some of the tastiest and silkiest tuna you may ever eat. To round off the course, deliciously sweet omelette, prepared just a chouple of hours before. There is very little English spoken and the menu is designed entirely around the ingredients sourced at the market that morning. But put your trust in this highly trained and highly skilled sushi master, and you will not be disappointed. 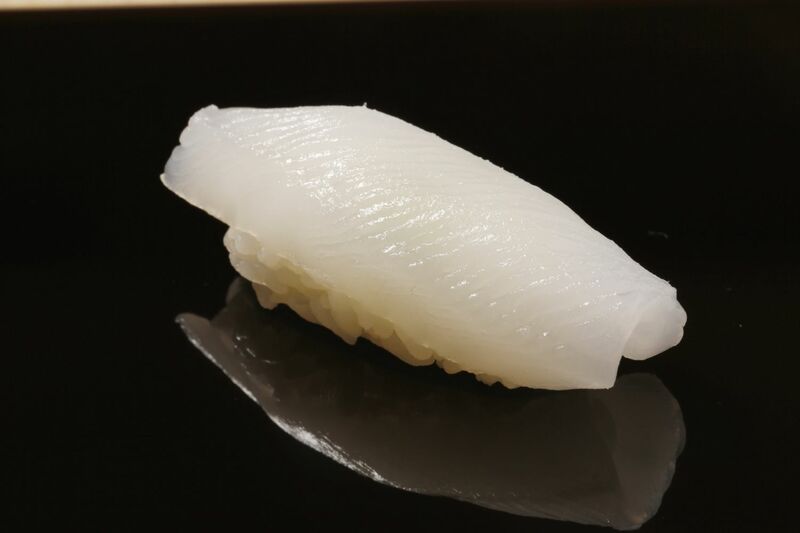 Chef Harutaka wants nothing but the best and is almost surprised by the question as to whether he visits Tsukiji market each morning to source his ingredients. Of course he does. He wants to speak to the fishmongers and see the products with his own eyes. He wants to buy the smaller tuna because he feels they lose flavor if they grow too large. He also invests a great deal of thought and time into the rice. In the kitchen, hagama traditional iron pots are constantly cooking up delicious, slightly firm koshihikari rice. 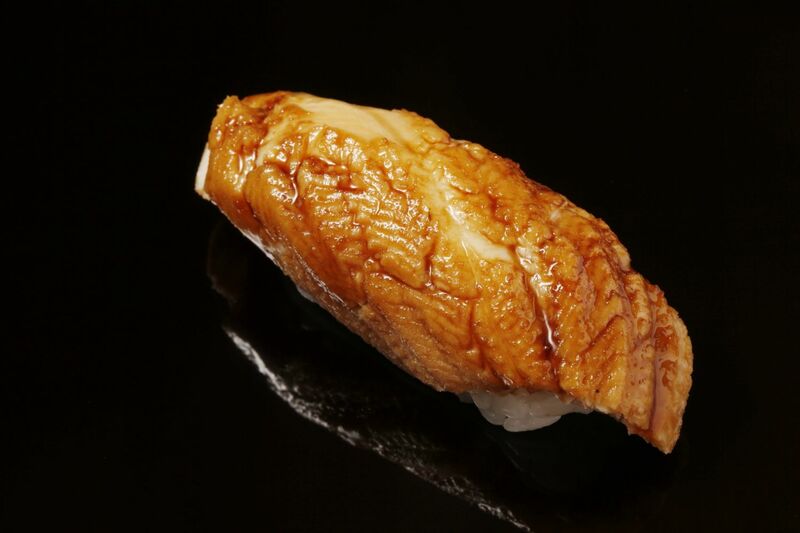 It is then flavored generously with Noto Peninsula salt and Shiragiku white vinegar before being allowed to rest for 30 minutes to allow the flavors to infuse and mellow with the rice. 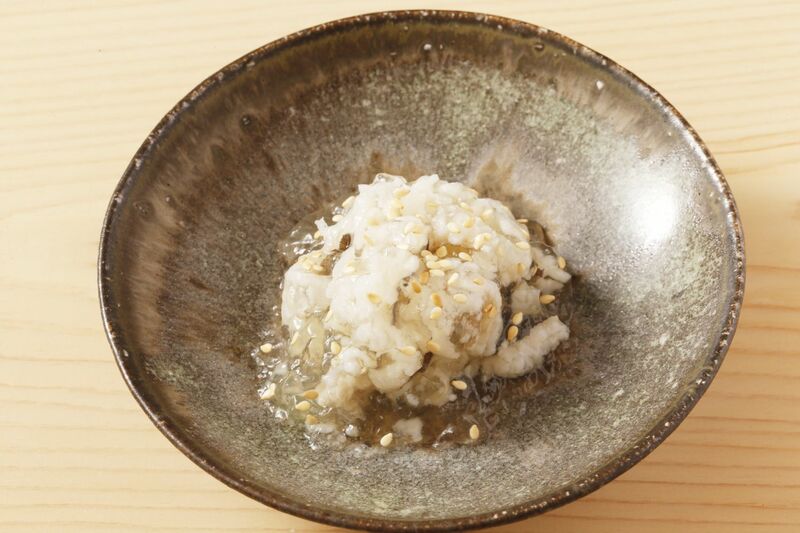 Chef Harutaka prefers the robust salt flavor and only ever uses white vinegar - the same variety day after day. He is confident in his style, not swayed by trends for ageing fish or switching between red and white vinegars. He has found his way and he is sticking to it. Originally from Asahikawa, Hokkaido, the kanji in Chef Harutaka’s name mean blue sky, but the unconventional reading for his name was given by his high school teacher father. Not interested in following that career, the young Harutaka was nonchalant about his studies deciding instead to become a sushi chef at the age of 18. He thought it looked pretty cool. 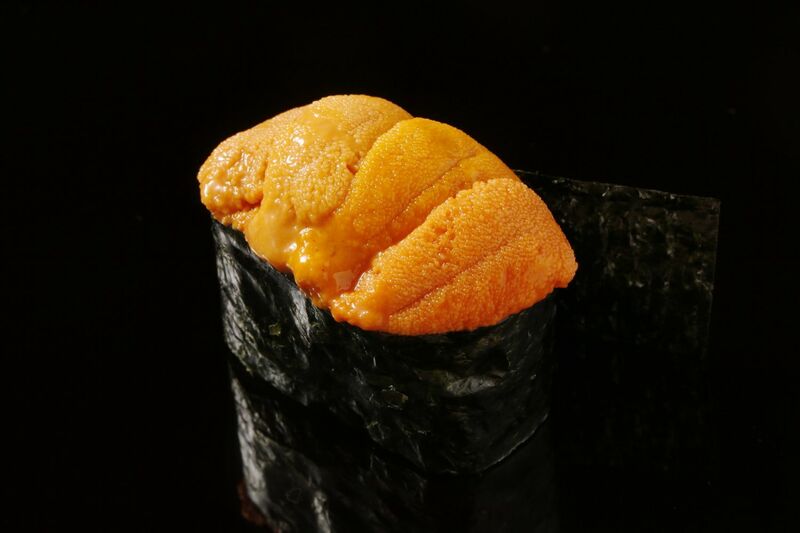 And after three years at a sushiya in Hokkaido, Harutaka realized it felt right and he was good at it. An encounter with the now world-famous Jiro from Sukiyabashi Jiro set him on the path to where he is today. For 13 years he trained under the master Jiro, working tirelessly to meet the highest expectations. 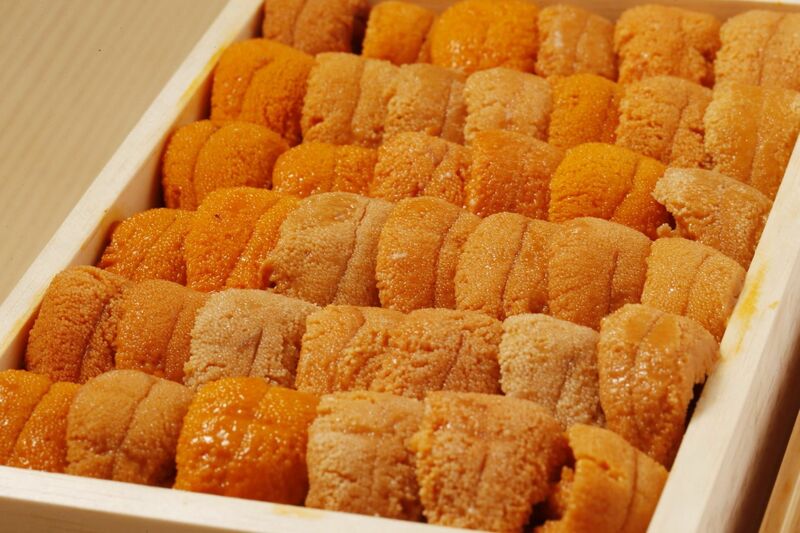 But he liked it, he was good at it, and it also helped that he was a favorite of Jiro, already in his 70s at the time. The motivation to go out on his own came for Chef Harutaka when he realized that he wanted to interact with and nurture his own customers. Chef Harutaka is fastidious, firm, and loyal. He is precise but not stiff and allows himself a laugh or a smile as he crafts dishes with his trusted staff by his side. 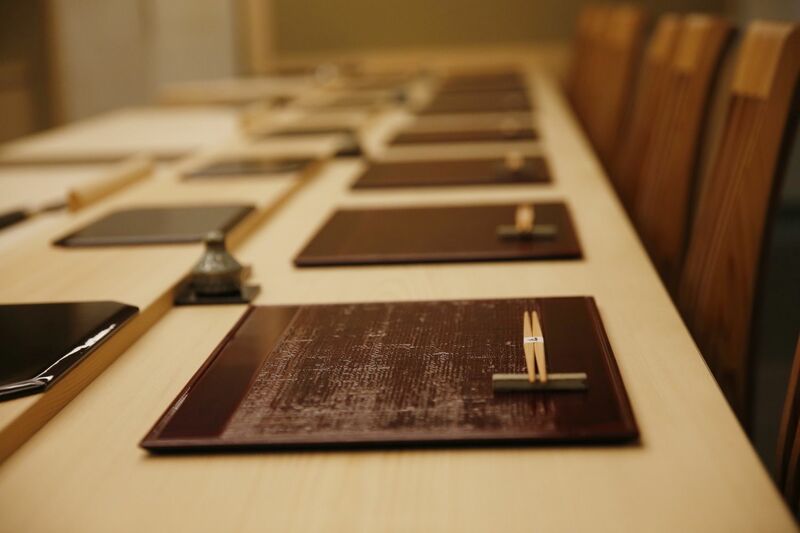 He is so particular about every element of the dining experience that he epitomizes the Japanese word ‘kodawari’. Do as you wish to do; and allow others to do the same. This is Chef Harutaka’s vision. He has allowed himself to create this new location exactly as he wishes it to be. So it seems this will be Chef Harutaka’s space for some time to come, where he feels comfortable and creative, where he can nurture his customers and nurture his staff and serve up rich flavorful bites for those lucky enough to dine here. The tableware is a collection of pieces that have taken the chef’s personal fancy. 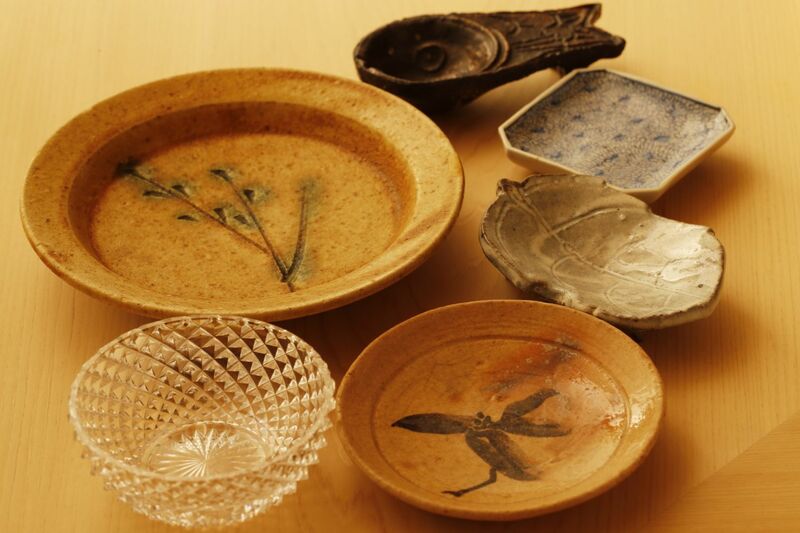 They come from various artisans around Japan and overseas. Not selected by location or potter. Chef Harutaka likes to visit exhibitions; to find new pieces. The style, in general, is subdued tones of browns and greys, with occasional splashes of color from a small tin dish or a glass with a striking bubble design. The designs should not overwhelm the reserved beauty of the food, because after all, it’s all about flavor.